Includes 3 AAA batteries. Durable construction and lightweight design for easy transportation. Carry handle. Four virtually indestructible LED bulbs providet thousands of hours of continuous lighting. Product Size (H x W): 6.00 x 3.88 Imprint Area: Bottom of Front 5/8"h x 1 3/4"w Packaging: Gift Box Pieces Per Box: 36 Weight Per Piece: 0.58 lbs. Weight Per Box: 21 lbs. Case Dimensions (L x W x H): 24 x 13 x 14. Light up your campsite, cook-out or next outing with this ultra-bright, seven LED lantern. Three light functions provide just the right amount of brightness for any occasion. 7 ultra-bright LEDs 3 light functions: high, low and blink Durable aluminum body Metal hanging loop Certifications: RoHS, CE Batteries included: 4 AAA (replaceable). Size: 1-3/4W x 5H Standard Print Area: Base, below switch, 1/2W x 1-1/8H Optional Laser Engraving Area: Base, below switch, 1/2W x 1-1/8H (white underlay; oxidized to appear black) Other decorating methods are available for this item, please call. Packaging: Individual gift box Package Quantity: 87 Package Weight: 26 lbs. Coleman 4d camp lantern features a Krypton bulb providing extremely bright, long lasting light, durable plastic house and is weather resistant to withstand the elements. Powered by (4) D-cell batteries (not included). Product Dimensions: 6" x 3" x 3" Imprint Size: 1.5"W x 1.5"H. Case Pack Qty: 12 Case Pack Shipping Weight (lbs. ): 5. Coleman stormbeam dynamo flashlight with nimh rechargeable battery pack powered by a hand crank. One minute of crank results in 30 minutes of useable light. Features bright 5mm LED that never needs replaced. Product Dimensions: 2-1/4"6-3/8" x 2-5/8 Imprint Size: 1.75"W x .25"H Case Pack Qty: 6 Case Pack Shipping Weight (lbs. ): 2. Compass included. Durable construction provides years of hard use under adverse outdoor conditions. Carry handle and hook. Includes 4 D batteries. Product Size (H x W): 9.50 x 5.50 Imprint Area: Bottom 3/4"h x 1 1/2"w Packaging: Gift Box Pieces Per Box: 8 Weight Per Piece: 2.25 lbs. Weight Per Box: 18 lbs. Case Dimensions (L x W x H): 23 x 12 x 13. 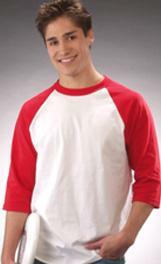 Dobby-Tec 420d polyester with PVC backing. 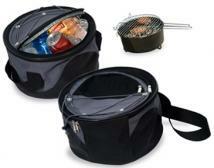 Outer chamber holds the grill while the insulated and lined inner cooler compartment holds up to ten 12 oz. cans. Heavy-gauge steel grill that burns charcoal or wood. Size : 6" tall; Bottom dia. : 12 1/4" case Size : 5 1/4" tall; Bottom dia. : 12"grill Size : 3 1/2" tall; Bottom dia. : 10 1/4" cooler Imprint Area: 4"w x 2"h Packaging : Bulk Shipping info: 6 pieces per carton, 28.00 lbs per carton, carton size 11.00" x 14.00" x 22.00"
Coleman twin quickbed utilizes the Airtight System that guarantees leak-free inflation in addition to the Advanced Double Lock Valve that locks in air two ways. This bed also features Wrap 'N' Roll to save time just roll into attached carrier, tie and transport. Other features include durable, heavy-duty PVC construction, and soft suede top for luxurious comfort. Conveniently fits standard sheets. Inflated size is 74" x 39" x 8.5". Inflates in 90 seconds or less with electric QuickPump unit (sold separately). Product Dimensions: Inflated size: 74" x 39" x 8.5" Imprint Size: 5"W x 5"H. Case Pack Qty: 4 Case Pack Shipping Weight (lbs. ): 27. Coleman stormbeam dynamo deluxe flashlight with NiMH rechargeable battery pack powered by a hand crank. One minute of crank results in 30 minutes of useable light. Features bright 5mm LED that never needs replaced, built in FM radio with channel scan, and cell phone charger with six of the most common adapters stored inside. Product Dimensions: 2-1/4"6-3/8" x 2-5/8 Imprint Size: 1.75"W x .25"H Case Pack Qty: 6 Case Pack Shipping Weight (lbs. ): 5. This self-powered camping and safety essential never needs batteries. A handy car charger supplies long-lasting power while a crank recharger provides short-term illumination. 8 ultra-bright, white LEDs and 8 red LEDs 3 light function: high white, high red and blink red Weather-resistant Includes silver hook for hanging and car charger Add only $2.39 per unit for handy wall charger Certification: RoHS Battery included: 600mA Ni-Mh storage battery (rechargeable); 3 AAA back-up batteries not included. Size: 4-3/4W x 10H Standard Print Area: Base, below switch, 1-1/2W x 5/8H Packaging: Individual gift box Package Quantity: 9 Package Weight: 29 lbs. 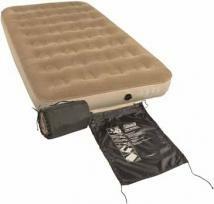 Coleman warm weather sleeping bag keeps you comfortable down to 40 degree with 3 pounds of ThermoTech insulation. This sleeping bag is full size, 33" x 75" and will fit most up to 5'11". Also utilizes ComfortSmart Technology, which includes: Comfort Cuff - surrounds face with softness, Roll Control - locks bag in place for easier rolling, Quick Cord - for easy, no-tie closure, ZipPlow - plows fabric away from zipper, preventing snags. 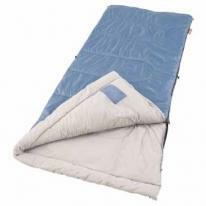 Colors: Sleeping Bag - Blue w/ Granite, Stuff Sack - Blue. Product Dimensions: 33" x 75" Imprint Size: 15"W x 12"H. Case Pack Qty: 6 Case Pack Shipping Weight (lbs. ): 31. Coleman 4d pack-away led lantern offers 35 hours of run time on low or 20 hours on high on (4) D-cell batteries (not included). This lantern features the Cree XLamp XR-E LED that provides 140 lumens on high. This cool touch LED keeps the lantern cool while operating. This lantern also collapses into itself with patented Pack-Away design. Other features include a durable, chrome-plated rhino guard, weather resistance to withstand elements, and a four-position switch for off/high/low/nightlight settings. Product Dimensions: 15.25" x 9" x 9" fully extended. Imprint Size: 2.5"W x 1.5"H. Case Pack Qty: 4 Case Pack Shipping Weight (lbs. ): 8. Comfortable padded back panel and straps are perfect for all outdoor activities. Large main compartment can store rain gear or a change of clothes. Separate rear compartment holds 2-liter water reservoir. 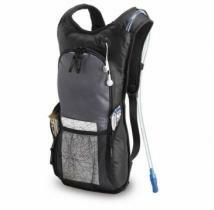 Front mesh pocket and two side zippered pockets provide additional storage for maps and snacks. Made of 840d polyester and 420 rip-stop. Product Dimensions: 9" H X 20" W X 10" D Imprint Area: 3" H X 4" W AVAILABLE ONLY IN ROYAL BLUE Other decoration methods are available for this item, please call. Additional Color/Location: (50)$0.60, (100)$0.40, (250)$0.35, (500)$0.30, (1,000)$0.30 Weight: 1.17 lbs. Coleman stormbeam dynamo lantern offers a rechargeable battery pack powered by a hand crank. One minute of crank results in 15 minutes of useable light on low. This lantern is great for power outages and emergencies. Also, features a bright .07 watt LED that never needs replaced. Product Dimensions: 8.75" x 5" x 5" Imprint Size: 1.5"W x 1"H. Case Pack Qty: 2 Case Pack Shipping Weight (lbs. ): 4. Coleman 8d led lantern offers 50 hours of run time on low or 35 hours on high on (8) D-cell batteries (not included). This lantern features the Cree XLamp XR-E LED that provides 175 lumens on high. This cool touch LED keeps the lantern cool while operating. Other features include a durable, chrome-plated rhino guard, weather resistance to withstand elements, and a four-position switch for off/high/low/nightlight settings. Product Dimensions: 15.25" x 9" x 9" Imprint Size: 2.5"W x 1.5"H. Case Pack Qty: 2 Case Pack Shipping Weight (lbs. ): 7. 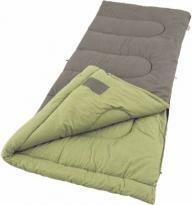 Coleman cool weather sleeping bag keeps you comfortable down to 30 degree with 3 pounds of Coletherm insulation. This sleeping bag is full size, 33" x 75" and will fit most up to 5'11". Also utilizes ComfortSmart Technology, which includes: Comfort Cuff - surrounds face with softness, Wrap 'N' Roll system - simply roll bag into attached carrier, and ZipPlow - plows fabric away from zipper, preventing snags. Color: Sleeping Bag - Brown w/ Green , Stuff Sack - Blue. Product Dimensions: 33" x 75" Imprint Size: 15"W x 12"H. Case Pack Qty: 4 Case Pack Shipping Weight (lbs. ): 30. Coleman quickbed utilizes the Airtight System that guarantees leak-free inflation in addition to the Advanced Double Lock Valve that locks in air two ways. This bed also features Wrap 'N' Roll to save time just roll into attached carrier, tie and transport. 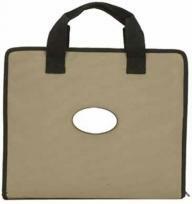 Other features include durable, heavy-duty PVC construction, and soft suede top for luxurious comfort. Conveniently fits standard sheets. Inflated size is 78" x 60" x 8.5". Product Dimensions: Inflated size: 78" x 60" x 8.5" Imprint Size: 5" x 5" Case Pack Qty: 4 Case Pack Shipping Weight (lbs. ): 39. All Coleman items are charged a flat rate shipping-please call to inquire. Go Fish Ii Package Includes: (1) Tackle Bag, (1) Citation 2 pc Spincast Combo, (1) Pan Fish Buster Lure Kit. Imprint Size: 6"W x 3"H Case Pack Qty: 1 Case Pack Shipping Weight (lbs. ): 4. 13 function multitool, 6 LED/1 bulb aluminum body flashlight, hatchet survival shovel/pick, saw, zipped nylon carry bag. Finish/Material: 600D Poly, Metal, Wood Dimensions: 12 1/2" W x 10 1/2" H x 2 1/4" D Imprint Area: 2" W x 3/4" H Shipping Information: Carton Size: Box Length: 17.72 Box Width: 12.99 Box Height: 11.02 Standard Packaging: Individually Carton Weight: 33 lbs. / 6 pcs. Coleman 4D Xps Led Duo Lantern is two lights in one with 2 detachable panels. Each panel features 6 LEDs and its own on/off switch and recharges from the base. Remove a single panel and light your way back to the tent or around the campsite. This lantern operates on 4, D cell batteries (not included) and will run for approximately 75 hours. Product Dimensions: 10 1/2"H x 6 1/2" diam. Imprint Size: 1-1/4"W x 3/4"H Case Pack Qty: 2 Case Pack Shipping Weight (lbs. ): 6. Coleman 8D Led Quad Lantern is four lights in one with 4 detachable panels. Each panel features 6 LEDs and its own on/off switch and recharges from the base. Remove a single panel and light your way back to the tent or around the campsite. This lantern operates on 8, D cell batteries (not included) and will run for approximately 75 hours. Product Dimensions: 11-5/8"x6-3/4"Dia. Imprint Size: 2"W x 3/4"H Case Pack Qty: 2 Case Pack Shipping Weight (lbs. ): 6. Coleman 8D Led Quad Lantern is four lights in one with 4 detachable panels. Each panel features 6 LEDs and its own on/off switch and recharges from the base. Remove a single panel and light your way back to the tent or around the campsite. This lantern operates on 8, D cell batteries (not included) and will run for approximately 75 hours. Product Dimensions: 11-5/8"x6-3/4"Dia. Imprint Size: 3-1/4"W x 1-1/8"H Case Pack Qty: 2 Case Pack Shipping Weight (lbs. ): 6. Coleman portable propane grill features the Perfectflow pressure control system, 180 sq. in. cooking surface, powerful 11,000 BTU tube burner, and removable heavy-duty porcelain-coated grill grate for quick and easy cleanup. Grease management system has removable dishwasher safe tray. Propane powered, uses standard 16.4oz disposable propane cylinder (not included). Up to 4-1/2 hours burn time on one fuel cylinder. Product Dimensions: 21" x 13-3/8" x 4-1/4" Imprint Size: 5"W x 3"H Case Pack Qty: 2 Case Pack Shipping Weight (lbs. ): 31. 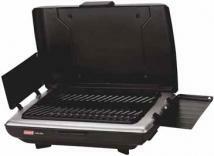 Coleman portable propane grill features the Perfectflow pressure control system, 180 sq. in. cooking surface, powerful 11,000 BTU tube burner, and removable heavy-duty porcelain-coated grill grate for quick and easy cleanup. Grease management system has removable dishwasher safe tray. 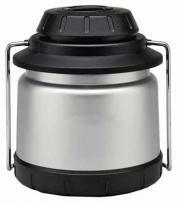 Propane powered, uses standard 16.4oz disposable propane cylinder (not included). Up to 4-1/2 hours burn time on one fuel cylinder. Product Dimensions: 21" x 13-3/8" x 4-1/4" Imprint Size: 7"W x 3"H Case Pack Qty: 2 Case Pack Shipping Weight (lbs. ): 31. Coleman Pack-Away Picnic Set For 4 features a lightweight aluminum frame. The table and benches fold down to a compact size for convenient storage and easy to transporting. The entire set weighs only 18.8 lbs. The benches can support up to 400 lbs each and the table can hold 300 lbs. Product Dimensions: Table: 25.4" x 24" x 2.9", Benches: 36.5" x 10.75" x 16.25, Set Folds to 25.4" x 24" x 2.9". Imprint Size: 28"W x 6"H Case Pack Qty: 2 Case Pack Shipping Weight (lbs. ): 30. Coleman Pack-Away Picnic Set For 4 features a lightweight aluminum frame. The table and benches fold down to a compact size for convenient storage and easy to transporting. The entire set weighs only 18.8 lbs. The benches can support up to 400 lbs each and the table can hold 300 lbs. Product Dimensions: Table: 25.4" x 24" x 2.9", Benches: 36.5" x 10.75" x 16.25, Set Folds to 25.4" x 24" x 2.9" Imprint Size: 34" W X 10-3/8" H Case Pack Qty: 2 Case Pack Shipping Weight (lbs. ): 30. 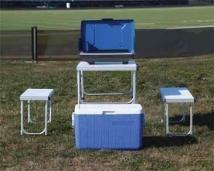 Coleman Tailgater Package with 1-color Screen Imprint on 48 Qt Cooler. Tailgater Package includes: (2) Woodsman II Chairs, (1) 48 Qt Cooler, (1) Road Trip Party Grill. Imprint Size: 15"W x 6-1/2"H Case Pack Qty: 1 Case Pack Shipping Weight (lbs. ): 53. 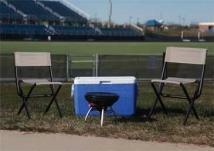 Tailgater Package includes: (2) Woodsman II Chairs, (1) 48 Qt Cooler, (1) Road Trip Party Grill. Imprint Size: 17-3/8"W x 8-3/8"H Case Pack Qty: 1 Case Pack Shipping Weight (lbs. ): 53. Shore Lunch Fishing Package includes: (2) Outback SE 2 pc Spinning Combos, (2) 6 lb. Super Mono EZ Fishing Line (110 yd) ea., (1) 48 Quart Cooler, (1) Table Top Propane Grill, (1) 6" Standard Flex Fillet Knife w/ Sheath. Case Pack Qty: 1 Case Pack Shipping Weight (lbs. ): 53. Shore Lunch Fishing Package w/ 1 Color Direct Imprint on 48 Qt Cooler. Shore Lunch Fishing Package includes: (2) Outback SE 2 pc Spinning Combos, (2) 6 lb. Super Mono EZ Fishing Line (110 yd) ea., (1) 48 Quart Cooler, (1) Table Top Propane Grill, (1) 6" Standard Flex Fillet Knife w/ Sheath. Imprint Size: 15"W x 6-1/2"H Case Pack Qty: 1 Case Pack Shipping Weight (lbs. ): 53. Tailgater Essential Package includes: (1) Pack-Away Picnic Set for 4, (1) 48 Qt Cooler, (1) Table Top Propane Grill. Case Pack Qty: 1 Case Pack Shipping Weight (lbs. ): 80. Shore Lunch Fishing Package includes: (2) Outback SE 2 pc Spinning Combos, (2) 6 lb. Super Mono EZ Fishing Line (110 yd) ea., (1) 48 Quart Cooler, (1) Table Top Propane Grill, (1) 6" Standard Flex Fillet Knife w/ Sheath. Imprint Size: 17-3/8"W x 8-3/8"H Case Pack Qty: 1 Case Pack Shipping Weight (lbs. ): 53. Coleman Tailgater Essential Package w/ 1 Color Screen on 48 Qt Cooler. Tailgater Essential Package includes: (1) Pack-Away Picnic Set for 4, (1) 48 Qt Cooler, (1) Table Top Propane Grill. Imprint Size: 15"W x 6-1/2"H Case Pack Qty: 1 Case Pack Shipping Weight (lbs. ): 80. Coleman Tailgater Essential Package with Decal on 48 Qt Cooler. Tailgater Essential Package includes: (1) Pack-Away Picnic Set for 4, (1) 48 Qt Cooler, (1) Table Top Propane Grill. Imprint Size: 17-3/8"W x 8-3/8"H Case Pack Qty: 1 Case Pack Shipping Weight (lbs. ): 80. 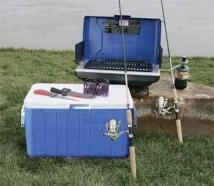 Coleman Getaway Camping Package w/ 1 Color Screen Imprint on 48 Qt Cooler. Get-Away Camping Package includes: (1) Sundome 9' x 7' Tent, (2) Sleeping Bags, (2) Stuff Sacks, (1) 2-Burner Stove, (1) 48 Qt Chest Cooler, (2) Woodsman II Chairs, (1) 2D LED Flashlight, (1) 2-Mantle Propane Lantern. Imprint Size: 15"W x 6-1/2"H Case Pack Qty: 1 Case Pack Shipping Weight (lbs. ): 91. Get-Away Camping Package includes: (1) Sundome 9' x 7' Tent, (2) Sleeping Bags, (2) Stuff Sacks, (1) 2-Burner Stove, (1) 48 Qt Chest Cooler, (2) Woodsman II Chairs, (1) 2D LED Flashlight, (1) 2-Mantle Propane Lantern. Imprint Size: 17-3/8"W x 8-3/8"H Case Pack Qty: 1 Case Pack Shipping Weight (lbs. ): 91.